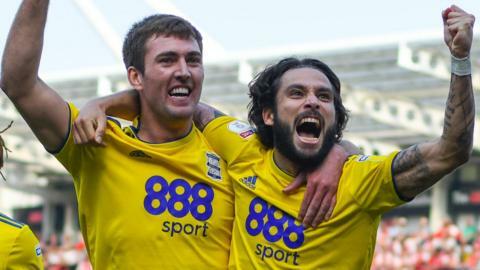 Birmingham City secure Championship survival by coming from behind to beat relegation rivals Rotherham United. Daniel James is "a phenomenal talent" who has the speed of a "motorbike" and is destined for big things, according to Rotherham manager Paul Warne. Rotherham's survival hopes are dented in controversial fashion as Swansea City edge a thrilling contest 4-3. Michael Smith and Matt Crooks score as relegation-threatened Rotherham come from 2-0 down to earn a point at Stoke. Watch highlights as Phil Foden scores his first goal at Etihad Stadium as Manchester City score seven against Rotherham to reach the FA Cup fourth round. Rotherham's Will Vaulks explains why playing for Wales means so much - and why he does voluntary work after training. Aston Villa or Fulham, who meet in the Championship play-off final, will receive at least £160m in revenue after promotion. An unwanted away record and two penalty saves in a game are among things you may have missed from Saturday's EFL action. A badly-timed protest and a manager in need of a slice of luck are among five things you may have missed in the EFL. After being given permission to speak to Rotherham about their vacant manager's job, should Alan Stubbs leave Hibernian?